Featuring incredibly beautiful colors, which add sparkle and glow to this pewter peacock, it becomes an awesome decoration for any room. 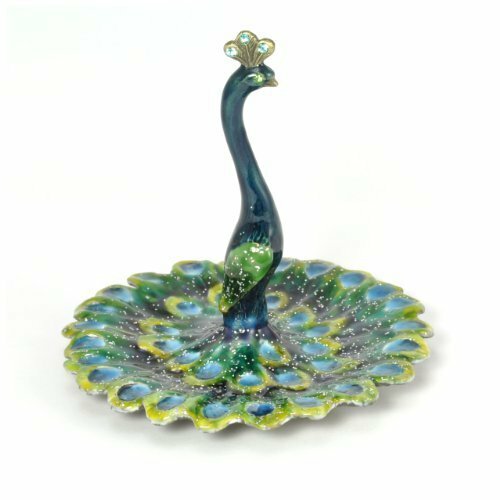 Colorful and shiny, this peacock jewelry holder is ready to enhance the ambiance of your room. It will add a note of elegance, beauty and brilliance to any room. Women love everything that is related to elegance, beauty, fashion and jewelry. So if you have these passions, then you’ll definitely want to have this Peacock Enameled Pewter Jewelry Holder, to decorate your room and to keep your beloved jewelry organized. This peacock holder is elegant and graceful, exactly as it is a peacock in reality. You can use this beautiful decorating piece as a holder for your jewelry, such as rings, earrings, bracelets and necklaces. Its beautiful feather tray gives you enough space to hold some of your favorite jewelry and small accessories, where you will keep them organized. The long neck of this peacock is excellent, as it gives you various possibilities for displaying some of your jewelry and accessories. Besides, the feather tray is a perfect place for holding small jewelry, as you no longer need to worry that they get misplaced or lost. And if you don’t know what to offer as a gift to someone special, for any occasion, this is an excellent choice. This enameled pewter peacock jewelry holder would make an excellent gift to anyone, as it is ready to embellish the appearance of any vanity or dressing table. It is painted by hand, so each of the pieces is also a unique item.